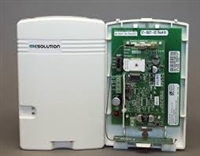 Converts hardwire zones into GE-compatible wireless signals. 8 Hardwire loops with end-of-line resistor detection. Unique wireless ID for each zone, plus 1 for main device. Transmit diversity for long reliable range. PIR/Glassbreak powering (via external supply). 3 year operation on batteries (monitoring contacts only). Complete supervision of zone tampers and low battery. Listens to DSC 433MHz protocol wireless devices. Enrolls up to 63 devices. Unique wireless ID (or loop) for each zone, plus 1 for main device. All sensor alarm, supervisory and trouble signals are passed through. Dual antennas for both Receive and Transmit diversity for reliable range. Complete supervision of tampers, external power supply fault and low battery. Converts hardwire zones into DSC-compatible wireless signals. Unique wireless ESN for each Translator loop, plus 1 for main device. PIR powering (via external supply). 3 year operation on batteries (contacts only). Converts hardwire zones into Honeywell-compatible wireless signals. Listens to Honeywell protocol wireless devices. Complete supervision of tampers, external power fault and low battery. Listens to GE protocol wireless devices. Unique wireless ESN for each zone, plus 1 for main device. Listens to NAPCO protocol wireless devices. Listens to 2GIG (& Honeywell) protocol wireless devices. Loss of AC/DC power indicator, Translator will beep once a minute.